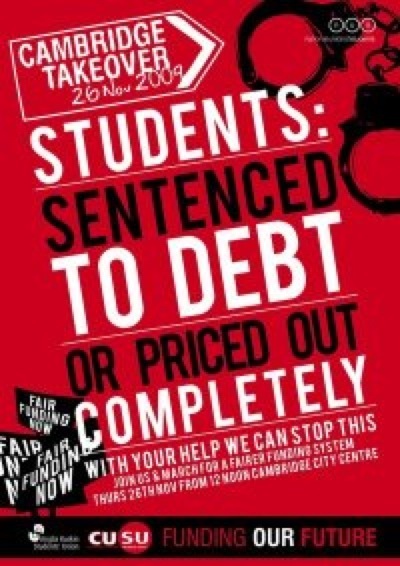 On Thursday the 26th of November students from all Cambridge’s universities are holding a protest against the levels of debt many students get in during their courses as a result of high, and increasing, tuition fees. The protest is to involve a walk through the city centre starting in East Road at midday and is followed at 19.00 by a debate to be held in the Cambridge University Law building. The debate is being billed as an opportunity to “influence your local decision makers”. It will be interesting to see who attends; and if university bigwigs, MPs, and candidates are present. Andy McGowan, the organizer of the Cambridge event, has explained the aim of the day’s events is to get students, academics and residents from the city and further afield on-board the campaign to prevent further increases in tuition fees. Liberal Democrats. With the candidate unknown and the Lib Dems so inconsistent it is almost impossible to determine what stance anyone standing for the Lib Dems in Cambridge might take. At September’s Liberal Democrat conference the big news was that party leader Nick Clegg weakened the party’s stance on opposing university tuition fees. Cambridge’s Julie Smith said something muddled in response. Daniel Zeichner, Labour. I expect during the next general election campaign the Labour Party will say that that it will reserve judgement until the review which it has put in place reports. Even if Labour are to make a manifesto commitment on tuition fees, after having said in their 2000/2001 manifesto: “We will not introduce ‘top-up’ fees and have legislated to prevent them” before breaking that promise to the electorate and introducing top-up fees anyway. Mr Zeichner’s policy webpage does not address the question of tuition fees, and he reportedly failed to respond to a request from The Cambridge Student asking him what his position is. Conservatives, Like the Liberal Democrats the Conservatives don’t have a candidate for Cambridge yet. Like the Labour Party they appear to be holding out for the results of the review. David Willetts, the Conservatives’ higher education spokesman, worked with the government setting the scope of the review on the question of increasing, and uncapping, tuition fees. Speaking on Monday 23rd November 2009 in Finchley David Cameron said that tuition fees, and top up fees have to stay. In summary that’s three undecided and one too extreme to be credible. On the subject of further increases the most undecided are the Liberal Democrats (with Labour and the Conservatives awaiting the review, but indicating support for further increases in fees). I strongly oppose removing the cap on tuition fees and charging UK students the cost which the international market will bear for courses. When I was at Imperial College Richard Sykes was rector, now an ex-rector Sykes would like to see the cap lifted, which would raise fees to (~£20K/year) and Vice Chancellors of other Universities want to see the current £3,225/year cap doubled. This would make the education I received completely inaccessible to someone in the position I was in. . I don’t think a prospective students’ ability to go to university should be determined by their parent’s wealth. I think it is right to use state funding for higher education to encourage people to gain qualifications in subjects needed by the nation. Entrance to university should be based on academic merit. 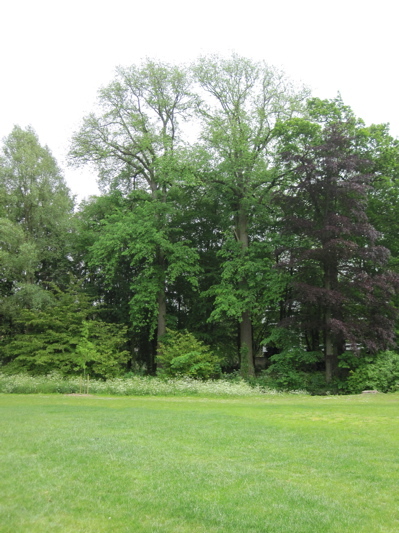 (Access schemes should be about awareness, not special treatment). With only about 50% of teenagers taking GCSEs getting 5 A-C passes including Maths and English Labour’s target of 50% of young people going to university is nonsensical. Efforts to improve education ought to be focused earlier. Ideally an even greater proportion of the population would go to university, but the proportion has to reflect educational standards in schools and the ability of the economy to provide graduate jobs (or the environment and support to start businesses). As a nation we ought to invest in higher education. We need to trade our way out of the indebted position a decade of Labour has left the country in. Having a well education population is key to that, especially if a major element of how we’re going to succeed is by providing knowledge based services, as I think it should be. There is a need for simplicity in the system of student finance. Those considering going to university need to be fully informed about their options with respect to funding. It’s really important that once at university students are treated equally whoever is paying their fees and how much they are paying. I don’t think tuition fees have resulted in an increase in quality of education so far, and don’t think future increases will help. I think accessible complaints systems, strong students’ unions, and strengthening the role of he Office of the Independent Adjudicator for Higher Education would do more to raise standards than higher fees. I do not think encouraging high levels of personal debt is good for the economy or society. We need to ensure the quality of Higher Education in the UK is maintained; not only for UK students, but to ensure the valuable “export market” for a UK University Education is maintained in the long term. Undergraduate teaching ought be closely linked to research. Research funding can, indirectly, subsidise teaching. Universities need to do a lot better at making money from the outcomes of research. While there are a huge number of non-jobs in this area there needs to be a step change in the seriousness with which commercialisation (or application for the social good) of research outcomes is pursued, in the interests of the universities, the national economy and people’s health. An independent review of higher education funding and student finance was announced on the 9th of November 2009 (Written Ministerial Statement) . The review is to be chaired by ex. BP chief executive John Browne. According to the question and answer page of the reivew’s website it is not due to report until Autumn 2010, well after the general election. This entry was tagged Cambridge, Education, Public Money., Universities on November 24, 2009 by Richard Taylor. Is this really the most sensible way forward? Research and teaching are very different beasts, and I do not think it would be sensible for research council funding streams for research to end up funding all of the teaching load. For instance, how do you see this working in Cambridge where small group teaching is college-funded whereas research grants are often held by the departments? I think a close link between research and teaching is right at the core of what universities, and a university education ought be about. In the best universities undergraduate courses are influenced significantly by the research work carried out at the institutions. This ensures that the teaching is at the leading edge of the subject and helps inspire students. It keeps the quality of university education high. Quality is really important. I see the funding link between research and teaching as indirect but critical. Research funding can be used to attract high quality staff, and fund infrastructure and equipment which benefits students’ education. At an institution like Imperial undergraduate teaching is already a drain on research resources. It is uneconomic for the institution to teach undergraduates at all. It is right and necessary to link research grants to teaching, otherwise an institution like Imperial, left to its own devices, may well decide to become a postgraduate only institution. I don’t think that would be in the national interest. I have to say that I still disagree on this one. The gap between the research front and the state of knowledge when kids leave school is growing — partly as the research front moves on and partly because the body of knowledge that kids need to be exposed to at school is much greater (whole subjects have appeared that simply did not exist 30 years ago). This tends to manifest itself in freshers appearing to know less (I would say they probably know more, but just spread more thinly). There is therefore a huge gap between the research mindset and the mindset best suited to teaching undergraduates; many of the research skills that were commonly taught to undergraduates when my parents were at Uni being are more commonly introduced at the postgraduate level now. I have also been very impressed by the US system (which my brother has gone through) where there is a much greater emphasis on explicit teaching positions (i.e. the TA positions, where the emphasis is very much on the teaching with research slotted in when you can). It is also worth noting that the US system seems to produce good results, although it is hard to know how much of this is the structure and how much the funding levels. But much of the teaching there is essentially done by grad students to fund their own Ph.Ds. I can’t help feeling, though, that all this slightly misses the point. In the UK, the underlying problem seems to me that we undervalue skilled technical work and so anything other than a classical academic/university education is somehow seen as second class training. This undermined the concept of both secondary moderns and polytechnics. The idea that 50% of people should continue in some sort of training seems very sensible (indeed, why stop at 50%?). The idea that university is the right vehicle for this training seems, to me, absurd. At the debate Cambridge Labour PPC Zeichner committed vote against any increase in tuition fees. He said he would rebel if necessary and, as usual, cited his differences with John Prescott on private housing associations providing social housing as evidence he is prepared to go against the party line. The conservatives were represented by Cllr Chris Howell. National Union of Students president Wes Streeting encouraged NUS members present to sign up, with their home and university addresses, to a service the NUS will be running to alert its members to candidate’s opinions on tuition fees and perhaps other matters. Personally I’m not entirely confident with either Zeichner or Streeting’s promises. In the above article I wrote: “Universities need to do a lot better at making money from the outcomes of research” the suggestion being that’s a major route through which universities ought be funded. The Universities give students poor or no support if a complaint is made, the unions are not interested and legal expertise is limited and expensive.The comment about strengthening role of the OIA must have been made without any experience of this PRIVATE organisation. The OIA not only misrepresents itself to students, it (as with its University paymasters) are unaccountable for their action, they know this and exploit it. Try asking them to explain their decisions and why they ignore where procedures have been breached. The only response will be defensive. The OIA exists to prevent legal action against Universities from students. It does this very well by wasting a huge amount of time in “looking” at complaints, the vast majority of which are not upheld and the few that are have minimal compensation. Given the exceptionally unequal situation regarding legal expertise/support between a student and a University with its vast networking powers, the free service offered by the OIA is initially attractive to students. The bottom line is the OIA is not obliged to investigate anything. Unfortunately no one has taken the trouble yet to investigate the OIA as there is no support group for students that are unfairly treated by these monoliths of higher education. I am aware that in its current form, and with its current role, the OIA is not effective; that’s why I am suggesting improving and strengthening it. At the moment the OIA is inaccessible to all but a tiny fraction of students who have experienced problems which their institutions are unwilling to address. The answer may well be replacing rather than reforming the OIA but there needs to be a body carrying out their role effectively – it could even be an office in the central government department responsible for universities. With respect to PhD students I think the UK research councils ought be doing a lot more to ensure those they fund are treated fairly. I have suggested that minimum standards should be set for disciplinary and complaints procedures and think that instead of each research council (or other public funder) monitoring compliance that could be a role the OIA could take on. I agree the OIA is oddly constituted, but as all its members are public bodies it isn’t really a private organisation. There is no slur in the order of the email addresses. Some were easier to find than others. I hope someone will take notice of this simple funding option. Kathi & Keith Poskitt West Yorkshire. What you suggest sounds appealing, but I don’t think it will actually work. 1) Cambridge attracts a large number of students from overseas who will end up working overseas (it is a very cosmopolitan place). How are you going to reclaim money from them when they don’t file tax returns in the UK? 3) In the “graduate tax” approach you propose, in the long run most of the tax take will come from high earners. How are you going to fund the universities between now and the point where alumni are in well paid jobs? Money is needed in tertiary education now! Note that Brown’s proposal does effectively mean that students will pay back for their course after the event (through a loan scheme which also limits their liability if they don’t end up earning that much), and also has scope for bursaries and scholarships to support bright kids from less affluent backgrounds. I am genuinely interested — why do you oppose this? ?